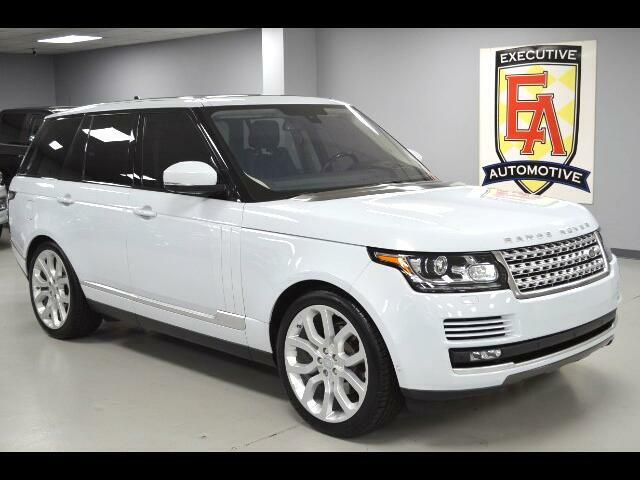 2016 Land Rover Range Rover 4WD Diesel HSE, Yulong White with Black Leather, Options Include: New Tires! 3.0L Td6 Turbocharged V6 Diesel, 8-Speed Automatic with Steering Wheel Mounted Paddle Shift, Engine Oil Cooler, 90-Amp Battery, 150 Amp Alternator, Towing with Trailer Sway Control, 4-Corner Auto-Leveling Suspension, Front and Rear Anti-Roll Bars, Dual Stainless Steel Exhaust, Front and Rear Vented Disk Brakes, Brake Assist, Hill Descent Control, Front and Rear Parking Sensors, Integrated Navigation System with Voice Activation, Smart Device Integration, Perimeter Alarm, Full Cloth Headliner, Metal-Look Gear Shift Knob, Day-Night Auto-Dimming Rearview Mirror, 5-12V DC Power Outlets, Heated Auto Dimming Side Mirrors with Power Fold and Turn Signal Integration, Deep Tinted Glass, Speed Sensitive Rain Detecting Variable Intermittent Wipers with Heated Jets, Fully Automatic Projector Beam High Intensity Low/High Beam Daytime Running Auto-Leveling Headlights, Rear Fog Lights, LED Brake Lights, Power Tilt/Sliding Panoramic Moonroof, Surround Camera System, Multi-Zone A/C, Power 2nd Row with Lumbar Support, Heated/Cooled Front and Rear Seats, Heated Steering Wheel, Blind Spot Monitor, Lane Departure System, Adaptive Cruise Control, Meridian Signature Audio System, Bluetooth Connection, Multi USB/Aux Inputs, Steering Wheel Audio Controls, 22" Alloys, Keyless Entry, Driver/Passenger Memory Seat, Console with Cooler Box, Power Windows, Power Locks, Power Mirrors, Power Seats, Power Tilt/Telescopic Steering Wheel, Power Liftgate and more! Contact Kyle Porter at 816-616-2500 or email: kyle@executiveautomotive.com for additional information. Thanks for your interest in our Range Rover HSE!